22 songs on CD teach and test all the division facts from 2 divided by 2 to 144 divided by 12. 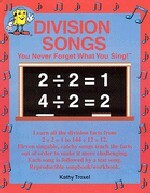 22 songs on CD teach and test all the division facts from 2 divided by 2 to 144 divided by 12. Facts are sung and tested out of order so it is more challenging. It is the next step after Multiplication Songs. Includes reproducible book and tests. To Review Other products that are very helpful in teaching Multiplication and Division, check out links below. Learn multiplication and division to clever songs. It’s fun and so much easier than boring rote repetition. A different song for each of the tables from 2 to 12.